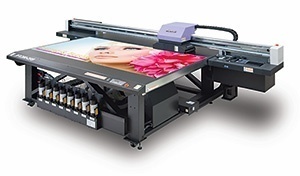 Mimaki introduces Flatbed Cutting Plotter "CF22-1225"
Mimaki Engineering Co., Ltd. (Mimaki), Headquartered in Nagano Prefecture, Tomi City; President, Kazuaki IKEDA, announced today the release of [CF22-1225] in November 2017, a new flatbed cutting plotter applying to 4x8 sized material (1,220 x 2,440mm / 4x8ft) of sign making and focusing to more enhanced combination performance of Print & Cut with JFX200-2513 of flatbed UV inkjet printer. 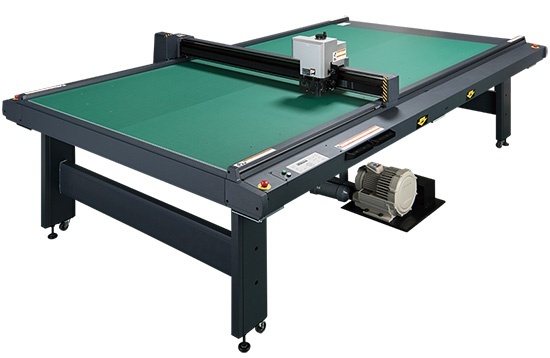 [CF22-1225] is suitable to cut 4x8 material (1,220 x 2,440mm / 4x8ft) of popular size of signboard production to be the optimal combination with [JFX200-2513], Mimaki UV flatbed inkjet printer for Print & Cut. More simple operation of Print & Cut is provided by [ID Cut] function, which enables to read cut data automatically to start cutting according to the recognition of ID printed together with images. Mimaki knowledge of all cutting references are concentrated to [CF22-1225], omnipotent for marking gauge to cut and fold coated cardboard etc. and reciprocating cut of foamed material used as cushions of package. This is really suitable for sample making and on-demand production of package. 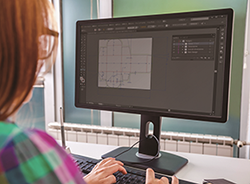 Combination use with CAD software, [ArtiosCAD DS] or Mimaki UV inkjet printer can support your business of receiving a total order from design of package/furniture, printing, cut of designed package till cushioning material to fit. This combination allows to save the cost and lead time. As well selectable cutter heads are ready to cover widely cutting industrial materials such as acrylic and rubbers. Depending on your application, the optimal cutter head can be chosen. [ID Cut] function is to print the ID information to cut and media rotation angle to be able to read the job data automatically to start cut on [CF22-1225]. It saves labor of media direction check and avoids loss of media, ink and time due to data transmission or media set failure. Flatbed inkjet printer applied with UV curing ink. Printable area is 2,500 x 1,300mm, available to print directly on 4x8 (1,220 x 2,440mm / 4x8ft) sized media, too. The available thickness of media is up to 50mm. Combination use of Mimaki UV inkjet printer and [ArtiosCAD DS] of CAD software can offer a total solution of design of package / furniture and printing, cutting from packages till their cushioning foam material etc. Such combination use can facilitate on-demand business of sample making and tiny lot production as well, development of small lot and wide variation of products. Moreover it realizes to save cost and lead time. * Specifications, designs and dimensions stated in this list may be subject to change without notice due to technical improvement etc.